The Fan Report is Inside the Hall’s version of Letters to the Editor. Submit a Fan Report at this link. Today’s entry was submitted by Kelin Blab. + Nic Moore, Spiece Indy Heat (pictured): The Warsaw guard took and made every big shot. He is very crafty inside and drew several fouls. He can flat out shoot it. He plays with guts and is willing to guard anyone. To begin the game he was guarding Aaron Thomas and did a good job on him despite the size difference. He was impressive to say the least. + AJ Hammons, Spiece Indy Heat: I hope prep school helps him next season with his physical play and toughness. He has a ton of upside, but drifts a lot in games. For a 7-footer, he really doesn’t make his presence felt on the court. Physically he looks great and he displays soft touch inside. Also a smart defender. + DeJuan Marrero, Spiece Indy Heat: Tough. That is his game. Tough defensively, tough rebounder, just tough. I, nor he, has any idea what position he will play in college. He played on the wing and struggled with his jumper and ball handling. If he gets a decent mid-range game and improves his ball handling, he will be a stud. What gets him over is he plays harder than anyone on the court at all times. + Aaron Thomas, Queen City Prophets: I finally saw a motivated Aaron Thomas. Prior to the game, you could tell he was ready for this one. After a shoving match with Purdue recruit Raphael Davis, Thomas went on a run on both ends of the court. He gets to the basket and finishes strong. In one instance he got to the basket and finished with a left-handed dunk. His ability to shoot is definitely there and he possesses tremendous upside. If a coach can get him motivated consistently, he will be a big-time player. He finished with 26 points. Good review. The only one on this list that I have seen play multiple times is Marrero and I agree with everything about him. Aaron Thomas would be a perfect fit at Indiana because Tom Crean is one of the best motivators I've seen. All gonna be good players down the line, but I LOVE Marrero. Thanks for that review Kelin. Good job. Great write up Kelin. Its also nice to see the observations you made with Nic Moore. People don't give this kid the time of day because of his lack of size, but the kid flat out gets it done. Northwestern has already offered Nic and I believe Minnesota is getting ready to. Painter scouted a couple Warsaw games last year, including the game Nic dismantled Deshaun Thomas. But I don’t believe they’re going to offer. If Nic is patient and doesn’t sign in the early period there might be a scholarship that frees up somewhere from a transfer, you never know. He’s going to have another big year and Warsaw should make another decent run in the tournament, so that might attract some attention. The Hall of Fame game against Bloomington South should be fun. I know he’s looking forward to it. I was glad to finally see Aaron Thomas in person so I could wipe out the you tube video. His first game as I said before wasn't that great, but against other major d1 players he just got it done. Moore, Davis, and Marrero all guarded him and he did not have a problem offensively. I also liked the fact he kept a cool head as the game got more intense and some 'jaw jabbing' began. I can see him as a Mo Creek replacement from his ability to put points on the board in multiple ways. Defensively he has the tools, needs the desire. + I am detaching myself from Nic Moore coming to IU because, I think Crean has so many other coals in the fire with JD, Young, possibly Nadir, and 2012 Yogi that Nic may not get an offer. 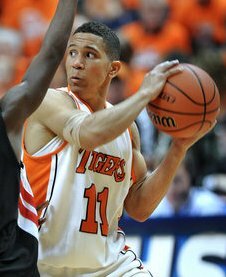 After seeing him play, I would take him over Davis for certain and would not think twice about it. If size is the only thing that is holding coaches back from offering him then they may be overlooking the other stuff. + If Hammons signs elsewhere I would not be be upset. I know he is young, but I don't see him turning out to be the difference maker at this point. I could easily make the case for Jurkin being more of an inside presence at this point than AJ. Kelin…who would you take, Nic or Yogi? I think I'm taking Nic…the kid is the most underhyped player in the state. If he was six foot he would be going anywhere in the country! Tough tough tough call. I can't even identify one advantage one has over the other….one glaring advantage Nic has over alot of kids that IU is recruiting, is he is a leader on his H.S. team, his AAU team….and this is the same team that Teague plays on. So to answer your question…if IU signed Nic and didn't get Yogi I would not be upset and we would have a point guard one year sooner. He can absolutely play. North Central Indiana has produced a lot of under-recruited kids. I'm not sure if coaches just overlook it (Alford doesn't, Concord's Dairese Gary is playing at UNM, and he recruited a few others to go to Iowa, but then, Alford coached at Manchester College, too) or if the local AD's/coaches are just not up to it, but when you consider that just at Warsaw, Nic Moore should have been playing with a few Plumlees the past few seasons, that team would have been quite a force. And even with just Moore, they made the state finals. It's a fruitful area up here. 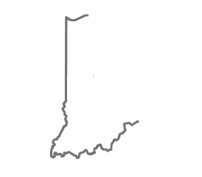 Someone will figure it out, I just hope it's IU, and not someone else. Thanks for your analysis of Nic. Full disclosure, I'm not an IU fan but follow Nic closely and would really like to see him go there because it would be a great fit for both. Some players have the basketball instincts to overcome the height obstacle, ask Crean about Dominic James. Having said that, I agree with you that IU will likely move on without offering him a scholarship. He'll end up somewhere like Minnesota and be a pain in IU's side for four years. I saw Nic play twice, Crean was there once, but Fife was at of their both games. At the second game I saw Northwestern and IUPUI. It would not surprise me Northwestern be the big ten school that offers him and it would be a good fit for nic. Not a BCS school, but still a very good basketball program with talent, in the big ten, and a place he will play. I am kinda surprised Painter hasn't offered moore given he has had some time with a small guard like Lew Jack….who is certainly not better than Moore IMO. I am holding out a small ray of hope, but if it doesn't happen at the end of this summer season it probably won't happen with IU. I've seen very little that has impressed me from Hammons. I just think if he gets a big-time scholarship it's only because he's 7' tall, unless he blossoms in the next year or two. I'won't be surprised to see him end up somewhere in a non-BCS conference. I didn't know they were in the hall of fame game v south…that has officially become a road trip game. Thanks for the info….He ultimately could be IU's spring signing if he is patient. Ok…crazy theory or wishful thinking, per twitter, Crean was watching Spiece indy heat in Highland today or yesterday….the same team he watched here in Indy. Who is on that team…? Hammons, Marrero, and Nic Moore. 2 of the 3 have offers…..a good feeling Marrero is not as a high priority as other 2012 wings…. Now could Crean be evaluating Nic Moore to determine if he is going to make an offer. Surely he is watching Hammons too but Moore is the one on that team right now that is on the court the most and is making a statement…. Call me crazy or wrong, but there is a reason Crean is or was in Highland watching that team. I'm hearing from inside sources Iowa and Michigan are both about to offer Moore! I believe that Iowa is getting ready to offer as well. I am hearing the same thing.